RIP, TouchPad. Can any non-iPad tablet survive - ever? Scores of would-be iPad rivals have hit the tablet market, but Apple is steamrolling the competition. 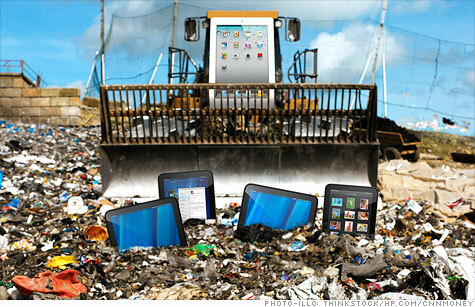 NEW YORK (CNNMoney) -- In the pre-iPad world, skeptics predicted that consumers would have no need for tablets. Then Apple unleashed the iPad -- and immediately sold millions of them. OK, the critics acquiesced, there's a tablet market after all. Apple's rivals raced to get into the hot new space. Most of those devices flopped critically and commercially, culminating in HP (HPQ, Fortune 500)'s move last week to kill off its 49-day-old TouchPad tablet. The assumption all along has been that others will eventually get the hang of tablets, making the field diverse and fiercely competitive. The model here is the iPhone: Apple mastered it first and still holds a lucrative slice of the smartphone market, but lots of vendors have carved off a piece for themselves. But here's another scenario: What if the tablet market never materializes? What if it's an iPad-only market, now and forever? There's precedent for that too, as wild as it sounds. It's what happened with the iPod. When Apple (AAPL, Fortune 500) unveiled its revolutionary music player in 2001, it blew away the competition. Others got to the market years earlier, but Apple's slick design and vast storage capacity was unmatchable. Priced at a fairly steep $399, the iPod sold 125,000 units in its first two months on the market. Rivals immediately moved to copy Apple's playbook. Microsoft (MSFT, Fortune 500), Sony (SNE) and scores of smaller companies threw tons of R&D and marketing money at building a better iPod -- and failed. No one else ever got a meaningful toehold. Ten years after its debut, Apple's iPod line still holds at least 65% of the U.S. market, according to the latest estimates from IDC's Tom Mainelli, the firm's research director for mobile connected devices. If tablets follow that model, you end up with a field where "the iPad dominates indefinitely and every competitor squabbles over one tiny piece of the market-share pie," Time.com gadget columnist Harry McCracken wrote the day the TouchPad died. At the start of this year, more than 100 non-iPad tablets were on sale or in the works. But now the field is littered with outright failures, devices that never came to be -- and, at best, a few very mild successes. "The HP TouchPad is the sharpest example of the huge stumbles in the market," says Rhoda Alexander, director of monitor research at IHS iSuppli. "It was abrupt, and definitely a shocker, but struggles are going on all over." The Apple edge: "So far most other tablets are offering a hardware solution or a software solution, but not both," Alexander says. "Even if each one is good on its own, it takes work to put them together. Apple did that beautifully." That approach helped Apple cannonball into the media-player market. "It was elegant, it was fun to use, and they were very careful about what they put in and what they left out," Mainelli says of the iPod. "So while there were plenty of MP3 players in the market that were arguably 'better' than the iPod, none were easier to use, and none had the Apple cachet." That's what's happening with tablet market, says Ken Dulaney, Gartner's vice president of mobility. "When it really comes down to it, the tablet market had been around 20 years and hadn't yet sold a million units," he says. "Then the iPad comes in and changes everything." That happened with the iPhone, too -- Apple essentially invented the modern smartphone. But in that field, rivals were able to catch up. So what makes the phone market different than the music-player market? And which one better foreshadows the tablet field? Daring Fireball blogger John Gruber, a veteran Apple observer, thinks signs point to the latter. "Most people today still buy phones the same way they did in 2006: they go to their local mobile carrier store and buy whatever the sales staff there convinces them to buy. Over 100 million times, that's been an Android phone," he wrote recently. "[But] the tablet market doesn't today look anything like the smartphone market ever did. The iPad didn't enter the tablet market. It created the tablet market." Apple has sold more than 28 million iPads -- and for many tablet buyers, it's still the only game in town. About 93% of current tablet users are iPad owners, and a whopping 94% of potential buyers are looking at the iPad, according to a report this month from R.W. Baird. Second place for potential buyers, with a distant 10%, is the now-dead TouchPad. IDC's Mainelli cites two key reasons for Apple's iPod dominance: Its design superiority and iTunes. By making it cheap, convenient and easy to get music, Apple created an entire gadget-and-content ecosystem its rivals couldn't match. The App Store faces more obstacles -- especially if Apple keeps alienating major content publishers by demanding a big cut of their in-app sales -- but it's already stocked with an unmatched software lineup. "Apple has built an entire ecosystem to support and enrich the iPad for both customers and developers," says Instapaper creator Marco Arment. "A successful mass-market iPad competitor needs to be so good that people will ignore all of that, buy it in large quantities, and let it develop its own entire ecosystem." Who could challenge Apple: There's a dark horse in the tablet race: Amazon (AMZN, Fortune 500). The e-commerce Goliath is reportedly working on a tablet expected to debut this fall. "Amazon could make tons of money selling you the services, which means they can afford to sell you a tablet at cost," Mainelli says. The "give 'em the razor, make money on the blades" business model could be the key to beating the iPad: undercutting Apple on price. "The conventional wisdom is if you can buy No. 1, the iPad, for the same price, then why would you buy anything else?" Mainelli says. "People will pay more for Apple devices and the Apple experience, period. So to beat them, you've got to come in significantly cheaper." But until someone finds that secret sauce, analysts are dialing back their forecasts about the tablet market's diversity. Earlier this year, IHS iSuppli predicted that Apple's tablet market share would drop below 50% in late 2012. Now, the firm thinks that won't happen until 2014. "This isn't the type of thing where the competition can sit back and say, 'we're not going to play,'" says IHS iSuppli's Alexander. "An initial failure doesn't necessarily mean long-term failure." "Eventually, it will be more than an Apple market," agrees IDC's Mainelli. "What's less clear is when the competitors will start to come in." But the real question may not be "when" a real rival will emerge. It's "if."